Hoffa: "They Declared War On Us, We Didn't Declare War On Them"
"It's absolutely a war. They declared war on us. We didn’t declare war on them. They’re the ones that introduced right to work in 14 states, and went after public employee bargaining rights in both Wisconsin and Ohio. We’re fighting them across the board. 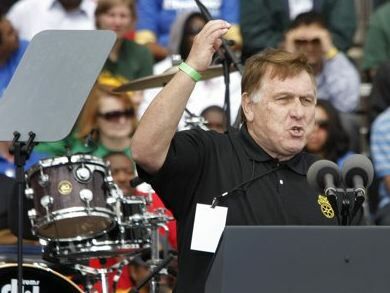 They want to roll the clock back to about 1900," Teamsters President James Hoffa told ABC News. Ann Compton, ABC News: "Now, the Tea Party wants deficit under control. It wants less government spending. Is that in itself anti-worker?" James Hoffa: "Well what it is basically, they want to balance the budget on the back of working Americans. They don't want to have more revenue from the billionaires and the trillionaires. They don't want the hedge-fund persons to pay what my members pay, maybe 30% in taxes." Scarborough: Where Is The Media On Hoffa Comment?